I am unable to remove Drive E: in Explorer for some reason. Drive E: remains even when rebooting my computer and when using the "Utilities...Explore Image...Detach" method. All of my backups now reside in drive E.
I there something I am doing wrong? Can someone please help me? What did you do to get a drive E? Did you mount a drive and give it the letter E? Was that letter in use before? Where were all your backups that now reside on E located before? Is E a physical drive now? Actually, I am not sure how I got E. I don't think I gave it the letter. E started coming up recently. I had been mounting files on G and H, which were available but they don't seem to be available now. Since then backups went to E and accumulated. Oh, one of my USB drives stopped working about a year ago. That might have been my physical drive letter E. is for my DVD. I don't see the connection though. Before I asked for help, I reinstalled the software but the same thing happens. I had files dating back to July 2017. Thank you for try to help. I still don't understand. Is your E drive a physical drive or partition? If so you can rename it in Disk Management. Where were your backups originally stored? Are they still accessible on the E drive? I regret that I am not communicating the situation well. It is due to my lack of understanding and inability to describe the problem. E is not a partition. The files are saved on a separate backup hard drive attached by a USB where it remains today. When I disconnect the backup drive, E is not on Explorer of course. It is on the backup drive. One last attempt to understand your problem. 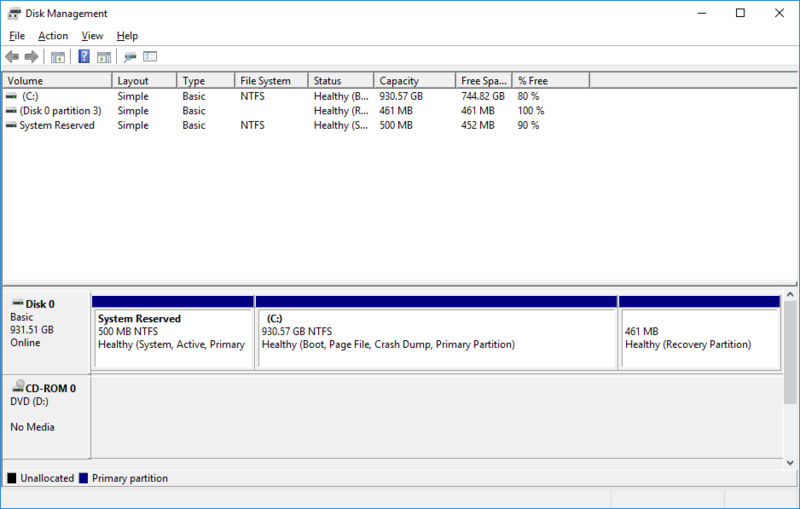 Could you post a screen shot of your disk management page without your external USB drive connected. One picture of what you are seeing may explain everything. Your screenshot shows what looks like a normal system. If you plug in your USB drive you should see it in Explorer and disk management and if it's labeled E that's what you'll see. If it's not plugged in you shouldn't see it. That would be a normal situation. So this brings us back to your original post about not being able to unmount or remove an E drive from Explorer. If there's more to this, please also post a screenshot of Explorer with the USB connected and one without it connected. At this point I think what you're describing is a normal situation.